The other day, I typed “be happy in life” (without the quotes) into my Google Toolbar search box and, lo and behold, my very own life coaching website was number 1 in Google Search, followed by links to its subpages and then another entry, pointing to the free inspiration articles on my site. “But this may be only in Australia”, I said to myself and checked on the main Google site. Be Happy in LIFE was showing in the first and second positions there too. “This is too good to be true!”, I thought in excitement, “I wonder what’s happening on the other major search engines”. Well, in MSN/Live Search, Be Happy in LIFE appears first and my contact page appears second. If this isn’t amazing enough, Yahoo! 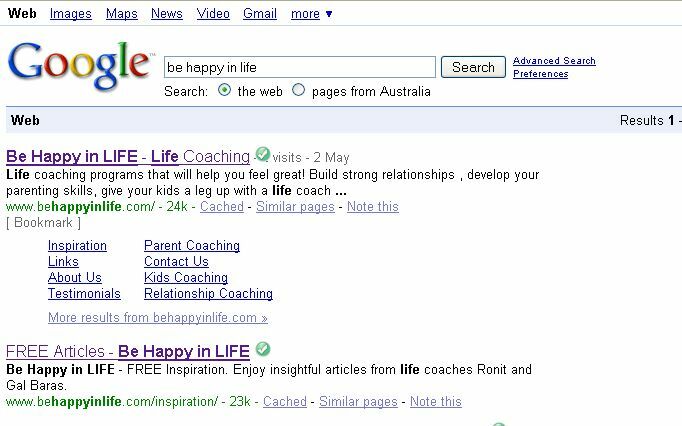 Australia agrees with Google.com, showing the Be Happy in LIFE home page first and the free inspiration articles second. The only one that rained lightly on my parade was Yahoo! global/USA, listing Be Happy in LIFE in the 5th place and the free inspiration articles page 6th. I decided this was OK and my day was still great. Of course, I share the secrets of how I’ve done this with my clients, so that they can get the same for their business. Would you like your business to top the search engines too?